You are here: GDevelop 4 Wiki » gdevelop » GDevelop Tutorials » How to distribute your game? When developing your game, you can preview it using the Preview button of the ribbon. When you want to distribute your games, you have to go through the export process. 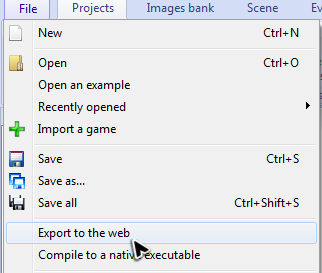 Then, choose a directory where export the game. You can also choose if the game will be minified. Click on Export to launch the export process. When it's over, you will be asked if you want to open the export directory. You can't play to the game from here, you have first to send all the files to a web hosting and then go with a browser to the location where you uploaded the game. In File menu, choose Compile to a native executable. 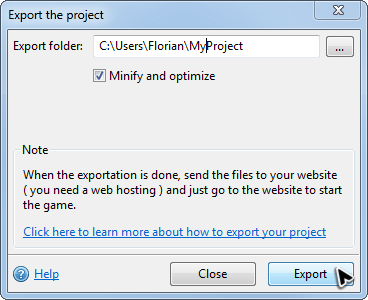 In the dialog, choose an export directory and then click on Compile. You can read here a description of all the options available. 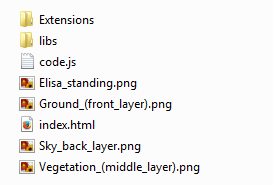 When the compilation is finished, all the files needed by your game are present in the chosen directory. You can launch the game by double clicking on the executable ( GameWin.exe by default on Windows, GameLinux by default on Linux ). If you want to share your game, you can compress the whole directory in a zip file, and then send it on the web using a web hosting or a service like DropBox. If you use external text files (.txt or .xml) for value storage/reading, files will not be compiled in an unique file nor moved in the folder, you'll have to copy/paste it and respect the relative path you've choosen in the project.